A properly maintained lawn grows thick enough to choke out any weeds. However, a lawn weakened by weather or disease gives way to the sprouting of unwanted weeds. Before starting any weed-killing program, identify the type of weeds growing in your lawn. Weed grasses in particular prove adept at blending in with the rest of your lawn, making it difficult to get rid of them. A healthy lawn, void of any weeds. Weed grasses closely resemble lawn grasses, making them more difficult to identify than other weed types. True grasses, grassy weeds grow as monocots, meaning they germinate from a seed and produce one leaf. According to Texas A&M University, these weeds develop hollow stems with joints and leaf blades that stretch longer than their width. They also grow a multitude of fibrous roots and have unremarkable flowers. The best weed prevention method is to maintain a healthy lawn. Proper lawn maintenance, according to American Lawns, includes fertilizing along soil test recommendations, watering deeply while letting the ground dry between watering, and mowing at an adequate height, usually no lower than 2 ½ inches. Sometimes, though, weeds grow despite the best prevention attempts, and application of chemical herbicides becomes the next step. A preemergent herbicide usually works the best to combat the unwanted presence of weeds. When using any chemical or herbicide, make certain to read the label and follow directions. 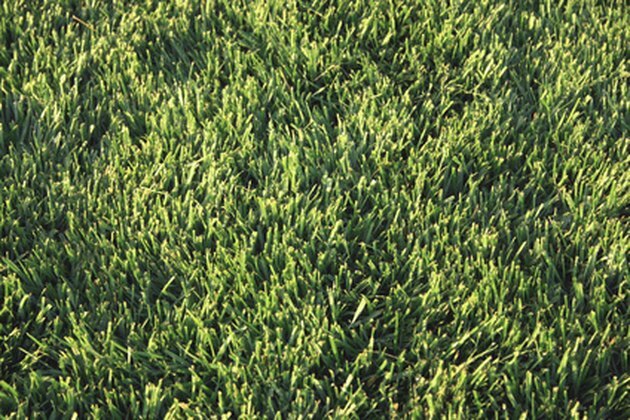 A summer-loving weed, Bermuda grass (Cynodon dactylon) rapidly advances across your lawn as the weather warms. Also an annual grass, it has fine textured leaves and grows in a creeping pattern. If this weed grass sprouts in a lawn with cool season grasses, it can quickly take over. Another annual weed grass, crabgrass (Digitaria sp.) also grows best in the unrelenting summer heat that can quickly turn green lawns brown. Crabgrass does not grow in shady places, as it requires full sun. The life span of this grass weed begins as a seed that sprouts in May and dies at the first hard frost. Dallis grass grows as a perennial grass weed best identified by its long seed heads. Its foliage has a light green color and it thrives in wet, hot conditions. Its growth pattern follows a circular motion as it expands out from the center of the weed. These two weed grasses also grow as perennials. Bentgrass has shallow roots and puffy, fine-textured leaves; the best way to remove it is by cutting it out. Quackgrass, on the other hand, grows underground through rhizomes that continue to sprout if not completely removed. A Kansas-based writer, Alecia Stuchlik has been writing since 2007. Her articles have appeared in “K-State’s Statements” and “Manhattan Magazine.” She has a Bachelor of Arts from Kansas State University in anthropology and English.